Are you a tool junky? Do you want a reason to feed your addiction? Just kidding - I know you don't need one, but soldering is a great excuse for explaining your torch accumulation! While you can get away with only having a few essentials, there are a lot of tools out there that makes the job of soldering a lot easier. In terms of the essentials, besides the flux and solder we've already talked about, and the pickle we'll talk about later, all you'll need is a butane micro torch ($30-ish) and a firing surface that won't absorb heat from your project. You'll need files and sandpaper, too, but if you've worked with any kind of metal in the past you should already have those on hand. 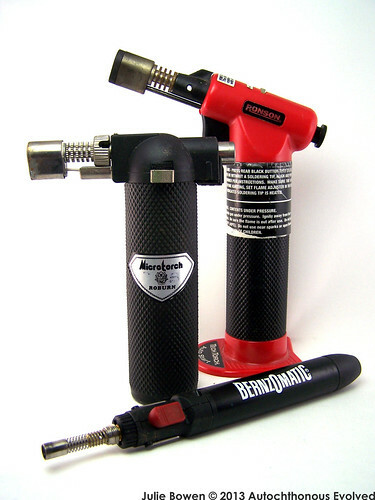 There are small, medium, and large butane torches as well as dual-fuel jeweler's torches that come with a variety of tips. Over the years I have acquired most of these. The duel-fuel Smith soldering torch is the most versatile, with its changeable tips, but for a young mom with limited studio time, I find it's also the most cumbersome (because of the tanks) and potentially-dangerous (because of the tanks), so I don't use it much right now. What I do have is a bunch of different sized butane torches. It's true that I have several butane torches where one jeweler's torch could do the job, but all three cost less than one jeweler's torch, they're portable, and they work well. The pencil torch was my first torch and it worked fine on jump rings. The torch itself seemed to be a little temperamental to fill and light, though. Then I got my Roburn MT-770 and for a long time it did everything I needed: soldering jump rings, fusing jump rings, balling up head pin ends, soldering earring posts, earring-sized sweat-soldering, and small bezels. When I started working on pieces bigger than 3/4" or 1" I found that I need a larger flame from a larger torch, for which I like my Ronson torch. Like any other butane micro torch, it has an adjustable flame, a self-lighting ignition, and flame-locking mechanism (so it stays on without you having to hold the trigger the whole time). While the sequence of unlocking the safety mechanism, lighting the flame, and locking the flame can be tricky the first few times you use any new torch, the Ronson is pretty easy to figure out and remember. If you can only choose one, and I think that's the situation for most of us at any given time (it's taken me almost ten years to acquire all of mine) the Ronson is the one I'd recommend. I got mine at an Ace Hardware (in Arden Hills, MN). What has always stood out to me is its well-defined flame tip. I also love the color, and the angle of the head makes it easy to get the flame where you need it without worrying about the flame blowing itself out as you work. 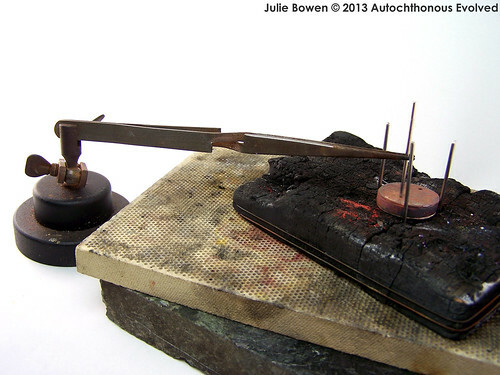 I can tell you that it also happens to work well for small torch-enameling projects. If you can't find that one, the Ronson micro torch is also a great general-purpose torch for small-ish projects. There is also a torch called the Jeweler's Jumbo Max Flame Self Igniting Refillable Torch, which is on my wish list for big projects, but for the time being, it hasn't been unbearable not to have one. This feels awkward to admit, but when I first started soldering this was the part that was the most confusing to me. I knew I needed solder, so I got that at my jewelry supply store. I told them I was new to soldering, but I remember feeling like I ought to have known more about what I needed than I did. They suggested some Handy Flux, which I bought, but I was too embarassed to tell them I had no idea what I was doing and to ask what else I needed and why. So, my beginning soldering experience involved a lot of trial and error. I got my pencil torch from a hardware store, like they recommended at the store, and I thought I could just use whatever protective-brick-like material I had on hand. It turns out that red clay bricks don't work as a soldering surface. So, I went on a quest. Why is a soldering surface different from a protective surface and what can I use? So, here's what you need to know. There are actually a lot of surfaces that work for soldering. The main characteristic a surface needs to have is that it reflects heat back up to your project rather than absorbing the heat and stealing it away from the metal you're soldering. That puts the all-purpose garden brick or cement block out of contention. 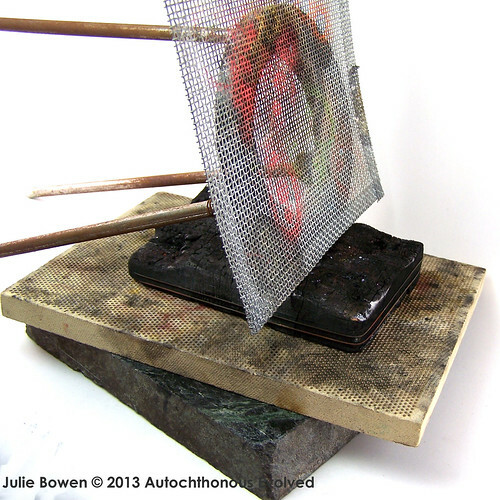 A perforated ceramic board works well, charcoal blocks (or a kiln brick), even a wire mesh suspended on a tripod. Different materials have different pros and cons about how they work. There are more soldering surfaces than what I'll talk about, but these are the ones I've used. The charcoal blocks reflect heat well and you can dig into them to support oddly-shaped projects, but they're also messy after a while when they start to break down. That being said, I've used my slowly-deteriorating charcoal brick for over 7 years. Perforated ceramic boards are a long-lasting hard surface. These are perfect for anything with flat surfaces or for lining up jump rings and soldering them like you've got your own personal assembly line. Granted, you could use a fine steel wire nest to support anything that was odd-shaped, but the ceramic itself doesn't change shape. Of course this means it's also durable and, other than some flux- and pickle-induced stains, after about 5 years the board still looks like new. I use my tripod and mesh when I need to heat something from underneath. Honestly, I use it mostly for enameling, not soldering. Sometimes I'll fabricate a project that's bigger than one torch can handle and the tripod and mesh allows me to use a torch on top and a second torch from underneath. But while the mesh and air around the project don't act like a heat sink, they also aren't super reflective. I'm sure there are artists out there that rock this set-up, but I prefer my ceramic and charcoal. 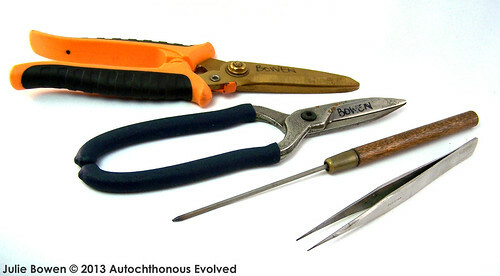 Once you evolve beyond jump rings and headpins and start working on soldering projects that involve two independent parts you'll find tools that help you hold things in place will be majorly helpful. The main tool for this is the third hand, which is a cross-locking tweezers held in a weighted vise that can be adjusted to hold almost any position. 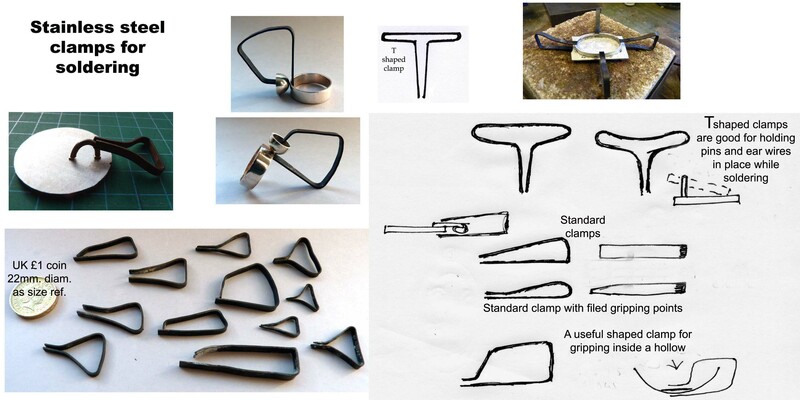 Some other simple tools include stainless steel pins, like old thin lampworking mandrels (which are the same thing as the stainless steel rods sold in a welding supply store), and stainless steel clips. The pins hold things together horizontally, like two shaped wires that you're trying to solder together. The clips hold things together vertically, like the top and bottom of a hollow metal bead that you need to solder to the center bezel. Soldering clips (or clamps) are just stainless steel rods or narrow strips of sheet bent to conform to whatever shape you need. When you bend your own clips, just make sure that the clip is designed to put some pressure on the piece when the solder flows, rather than simply holding it in place. Ever so briefly, let me also say that, if you're using sheet solder and cutting pallions, you'll also want some good metal shears that are easy to control, and either a soldering pick or pearl-knotting tweezers to place the pallions. There are also pickling tools and cleaning tools. But, since those aren't used in the actual soldering process, we can do those tomorrow.